On the right side a kotz has been added by a touchup. also the regel yemin swings round quite far and has a Moshav. I should think the yud is kosher. However the moshav is not really thich and strong enough to make it a chof. I would fix by adding ink and giving it a proper shape. Hard to tell - and I am also a grump about the whole enlarged pictures question - but it does look kosher. It looks kosher to me. My bigger concern would be the line above where the ksav is not on the sirtut. Here we can only see part of two words, but if there were four words in a row, it would be passul at least according to some. 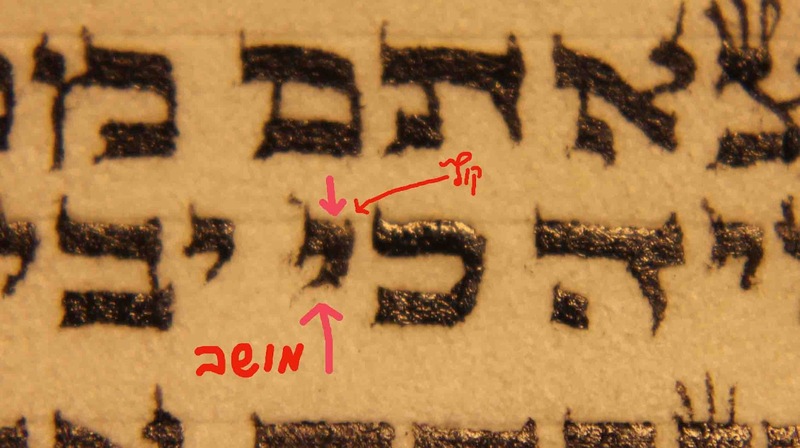 Others say that if the ksav is straight and near the sirtut it is kosher. For teymani sifrey torah on g'vil the minhag was to write just below the line, so it would be very difficult to pasul such a thing given that very accepted tadition. I agree that it is a kasher yud. The moshav is really far too thin (particularly bearing in mind this is an enlarged photo) to be of any consequence and could be removed. Since I don't think there is a doubt on the tsurah of the letter then this wouldn't be chok tochot I presume. I hate to say it again, but how can anyone give an informed decision when it is (a) enlarged; and (b) annotated. It is clear that this is not the appropriate method to pasken shailos. That's why I always answer these with the caveat that it is a photo. Also - when I look at these, I stand on the other side of the room so that it looks like the right size. I know that sounds goofy, but I agree - this is far from ideal. That's a good idea - as is saving the image and reducing it on screen to a reasonable size (say a 4-5mm high letter as an example - though many may have been smaller). I'm not sure that the enlargement completely invalidates this method of enquiry but the caveat is always there and no substitute for the sofer looking again at the real thing based on the suggestions made and making an informed decision as to what he really sees.